TOP:Torreon Chapter President David Rico talks about how Torren got it’s name with the Navajo Times in July 1. 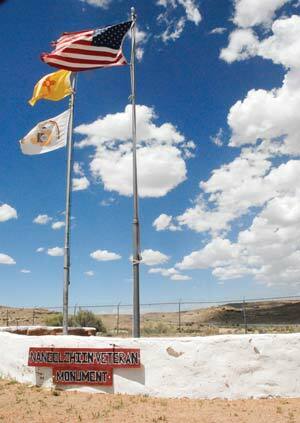 Rico said the Navajo name for their chapter is Na’neelzhiin. BOTTOM: Torreon Chapter President David Rico said their community has a high number of veterans and as their way of honoring them they build the Na’neelzhiin Veteran Monument in front of the chapter house. It stands to reason that the easternmost chapter on the "Big Rez" was heavily influenced by interaction with the Spanish who settled along the Rio Grande in the 1600s. Surnames here are overwhelmingly Spanish, and upon arrival here after our nearly three-hour commute from Window Rock, we almost wondered if we had headed south instead of east and ended up in Mexico. "Bienvenidos!" exclaimed Chapter Vice President Joe Cayaditto. "Sientense." The chapter's president, 75-year-old David Rico, could easily be mistaken for Mexican with his receding hairline and thick white mustache. In fact, he often is. "When we go to their (Mexican) restaurants in Albuquerque," he said, "they think we're them. They speak to us in their language. We just look at them with big, round eyes." So not everyone in Torreon/Star Lake Chapter is fluent in Spanish, at least not these days. And make no mistake, these are Navajos. Proud Navajos. "We are still within our four sacred mountains," wrote Rico in some materials he prepared for us, having anticipated our visit because Torreon was next in alphabetical order. "Our traditions and blessings have taken us thus far and hopefully our children and grandchildren will continue." In fact, if you want to enter the extensive summer youth employment program here, you had better know your clans and who your grandparents are -- or be prepared to learn. "We cannot stress enough that they learn that," Rico said as a smiling teen offered him coffee. "That's how you build community -- you have to know where you fit in." Building community is not always easy in Torreon/Star Lake. For one thing, the two main communities of Torreon and Star Lake are seven miles apart. Then there's the fact that this heavily checkerboarded chapter is comprised primarily of BLM land. Second is allotments, and third is tribal fee land. Trust land is the minority. The eastern boundary of the chapter is marked by the "BLM fence," beyond which Navajo cattle will be confiscated if they somehow get in. 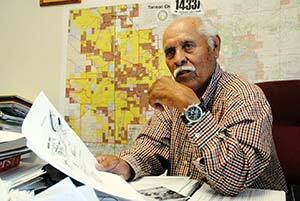 "If you want to talk about our indigenous land use boundary, it was way out there," Rico said. "All the way to the Jemez Mountains." He points to the striking volcanic plug on the horizon, known in Spanish as El Cabezon (The Big Head) and Navajo as Tsé Na Zhiin (Black Streak Rock). "Behind there was a place called Ch'ilchiinbito," he said. "That's where our grandmas and grandpas say we come from." The Navajos were driven out of that area during the Long Walk, said Rico, and when they came back it was outside the reservation boundaries and they were not allowed to settle there. Even in what is now Torreon/Star Lake Chapter, Mexican families who claimed old land grants were living and ranching. "We lived side-by-side with them," Rico said. "That's how a lot of us got our names. For instance, my grandfather had a lot of cattle, goats and sheep, so the Mexicans called him Ôrico' -- Ôrich.'" Today, the chapter is still heavily influenced by the old Spanish city of Albuquerque. A recently paved shortcut to Bernalillo has cut the distance to 80 miles -- which, to Navajos, is well within commuting range. "From my mom's house," said Rico, "if you get up about 5 in the morning, you can see a line of headlights all going into town. In the evening, you see them coming back." One consequence of being between the education meccas of Crownpoint and Albuquerque is that a lot of Torreonites have college degrees, and they're encouraged to spend their vacations in the chapter leading youth projects. Cayaditto pointed out erosion control dams, reseeding projects and a nice trail marked with stones running between the chapter house, the beautiful new senior citizens center and the BIE grant school. The trail, dams and new patches of grass are all courtesy of local youth. There are also less tangible projects, like a video documentary, in the works. The community has its own clinic, in a wing of the chapter house, and the parking lot is used as a helicopter landing pad for medical evacuations. Torreon's one convenience store has a checkered history. Trader Hooch Graham, who was known to lock up his customers who owed him money in a makeshift jail, was shot to death by a local in 1950, and a mob burned down the store. It was rebuilt and run by various traders until it was purchased by Thriftway in 1989. Name -- "Torreones," or watchtowers, were built on various high points here while the area was a base for the Mexican Army, to watch for Navajo raiders. The Navajo name for this area is Na'neel' Zhiin, ("Dark-colored barrier") after a mesa upon which early Diné would trap wild game by building a wall of rock and vegetation around them and then drive them through an opening in the blockade where they would fall off a cliff to their death. Population -- Chapter officials dispute the 2010 Census figure of 1,612, estimating it closer to 5,000. Land area -- 119,000 acres, most of which is BLM land or allotments. Major clans -- Kin Lich’inii, Haltsoo’ Dine'é, Tách’inii, Kin Yaa'áanii, Tó Dich’inii. Famous sons and daughters -- Code Talkers Preston and Frank Toledo, early teacher Iola Tsinniginnie. Assets -- Schools, Head Start, a new senior citizens center, a nonprofit community development group, frontage on New Mexico 197, gateway to Chaco Culture National Historic Park, chapter on its way to being certified. Issues -- feral horses, intricately checkerboarded land with little tribal trust land, long distance to tribal government in Window Rock, lack of housing, economic development, roads and bridges and employment. Torreon/Star Lake is well on its way to certification and should soon be able to collect local taxes from the store and any other businesses that spring up on New Mexico Route 197 in the wake of the oil boom north of here. Another thing Torreon/Star Lake has going for it is the Torreon Community Alliance, a nonprofit established by Maryland transplant Pat Kutzner. Kutzner wandered into the chapter house as a tourist in 1995 and has spent the better part of her retirement living in Cuba, N.M., and volunteering with Torreon/Star Lake. The Alliance has established a thrift store to fund its activities, the annual Eastern Navajo Arts and Crafts Festival (which just celebrated its 10th anniversary at the most recent festival, June 21), adult education and conservation projects. In addition, the chapter is making a vigorous push to get all its members electricity and running water. Some 50 independent solar and wind systems were installed in off-the-grid homes, and currently bathroom additions are going in anticipating the San Juan River pipeline that is expected to be completed in 2017. As money filters in through taxes and grants, future plans include both Navajo Housing Authority subdivisions and scattered-site housing, a library, an arts and crafts center, a multi-purpose building for the youth and a charter school. Businesses the chapter would like to lure in include a grocery chain like Basha's and a flea market. For now, however, "there's not much out here," admitted Rico. "We don't mind. We've been in survival mode all our lives, and we're still surviving."